How can I manage my projects in R? The scientific process is naturally incremental, and many projects start life as random notes, some code, then a manuscript, and eventually everything is a bit mixed together. Managing your projects in a reproducible fashion doesn't just make your science reproducible, it makes your life easier. It makes it easier to pick the project back up after a break. Fortunately, there are tools and packages which can help you manage your work effectively. One of the most powerful and useful aspects of RStudio is its project management functionality. We’ll be using this today to create a self-contained, reproducible project. Click the “File” menu button, then “New Project”. Type in the name of the directory to store your project, e.g. “my_project”. Click the “Create Project” button. Now when we start R in this project directory, or open this project with RStudio, all of our work on this project will be entirely self-contained in this directory. This is probably the most important goal of setting up a project. Data is typically time consuming and/or expensive to collect. Working with them interactively (e.g., in Excel) where they can be modified means you are never sure of where the data came from, or how it has been modified since collection. It is therefore a good idea to treat your data as “read-only”. In many cases your data will be “dirty”: it will need significant preprocessing to get into a format R (or any other programming language) will find useful. This task is sometimes called “data munging”. Storing these scripts in a separate folder, and creating a second “read-only” data folder to hold the “cleaned” data sets can prevent confusion between the two sets. Anything generated by your scripts should be treated as disposable: it should all be able to be regenerated from your scripts. There are lots of different ways to manage this output. 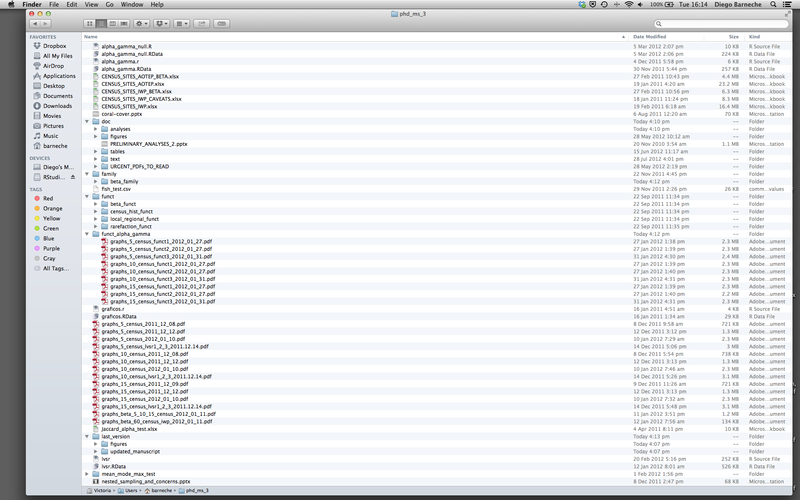 Having an output folder with different sub-directories for each separate analysis makes it easier later. Since many analyses are exploratory and don’t end up being used in the final project, and some of the analyses get shared between projects. Put each project in its own directory, which is named after the project. Put text documents associated with the project in the doc directory. Put raw data and metadata in the data directory, and files generated during cleanup and analysis in a results directory. Put source for the project’s scripts and programs in the src directory, and programs brought in from elsewhere or compiled locally in the bin directory. Name all files to reflect their content or function. One of the more effective ways to work with R is to start by writing the code you want to run directly in an .R script, and then running the selected lines (either using the keyboard shortcuts in RStudio or clicking the “Run” button) in the interactive R console. When your project is in its early stages, the initial .R script file usually contains many lines of directly executed code. As it matures, reusable chunks get pulled into their own functions. It’s a good idea to separate these functions into two separate folders; one to store useful functions that you’ll reuse across analyses and projects, and one to store the analysis scripts. You may find yourself using data or analysis scripts across several projects. Typically you want to avoid duplication to save space and avoid having to make updates to code in multiple places. In this case, making “symbolic links”, which are essentially shortcuts to files somewhere else on a filesystem, can let you use existing code without having to move or copy it. Plus, any changes made to that code will only have to be made once. On Linux and OS X you can use the ln -s command, and on Windows you can either create a shortcut or use the mklink command from the windows terminal. Now we have a good directory structure we will now place/save the data file in the data/ directory. Download the gapminder data from here. Save the file in the data/ folder within your project. We will load and inspect these data later. How many rows of data does it contain? What kinds of values are stored in this file? The file size is 80K. You can quickly open up a shell in RStudio using the Tools -> Shell… menu item. It is important to use version control with projects. Go here for a good lesson which describes using Git with RStudio.